In the last three years nika roza danilova has gone from being an outsider experimental teenage noise-maker to a full fledged internationally celebrated electronic pop musician. 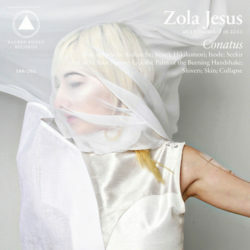 zola jesus is not a band; it is a solo project. zola jesus is not a singer; she is a musician. it has always been so. conatus is a huge leap forward in production, instrumentation and song structure. it says it all in the definition of the title: the will to keep on, to move forward. from thumping ballads to electronic glitch, no sound goes unexplored on her new record. it is an icy exploration in refined chaos and controlled madness, an effort to break through capability and access a sonic world that crumbles as it shines.